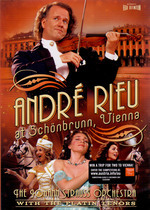 Andre Rieu At Schonbrunn DVD from DVDLand. 10. The Girls From The "Chantant"
Click the button below to add the ANDRE RIEU - AT SCHONBRUNN to your wish list.